In this talk, Jennifer Kelly traces the emergence of “solidarity tourism” as both an organizing strategy and an industry in Palestine. Solidarity tourism refers to forms of travel that are animated by a desire on the part of tour guides to cultivate solidarity with their cause and tourists’ desire to establish a deeper connection to or understanding of a particular social movement. 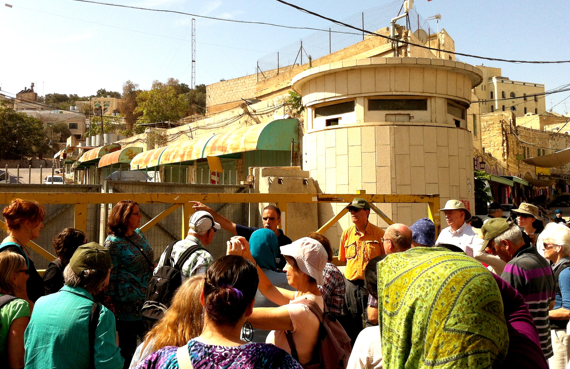 On solidarity tours in Palestine, tourists experience a freedom of mobility that is foreclosed to many of the Palestinian organizers guiding their movement. Drawing from ethnographic fieldwork in the West Bank and East Jerusalem, Kelly reads these moments of asymmetry as fragments of the tourist encounter that both expose the stark power differentials within tourism under occupation and also showcase tour guides’ strategic use of tourist mobility to circumvent the borders and checkpoints crafted to divide them. Kelly argues that solidarity tourism in Palestine reveals the unevenness that can inhere in transnational movement building and, at the same time, shows how Palestinian organizers and guides use tourism to stay anchored to land that is under the constant threat of annexation. In developing this argument, she probes the fault lines and fragments of narration that emerge in this encounter and asks what kinds of anti-colonial imaginings solidarity tourism in Palestine makes both available and impossible. Bio: Jennifer Kelly is a University of California President’s Postdoctoral Fellow in the Department of Communication at UC San Diego. She received her Ph.D. from the University of Texas at Austin in American Studies with a Portfolio in Women’s and Gender Studies in May of 2015. Her research broadly engages questions of settler colonialism, U.S. empire, and the fraught politics of both tourism and solidarity. She is currently at work on her first book, a multi-sited ethnographic study of solidarity tourism in Palestine. Writings from this project appear in American Quarterly and in the edited volume Theorizing Fieldwork in the Humanities: Undisciplined Approaches to the Global South(eds. Shalini Puri and Debra Castillo).